The Trinamul Congress is hoping to reap electoral gains in the Darjeeling hills from chief minister Mamata Banerjee's multiple region-specific initiatives like the formation of development boards and creation of Kalimpong district. An indication to this effect was given today by state tourism minister Gautam Deb when he expressed the party's desire to win elections at all levels from the rural body to Parliament in the coming months and years. "There is a municipal election here. We will have to fight well and win the election. There will be panchayat elections after that, and in August, the term of the GTA gets over...If we win all these elections, there will be the parliamentary elections in 2019. 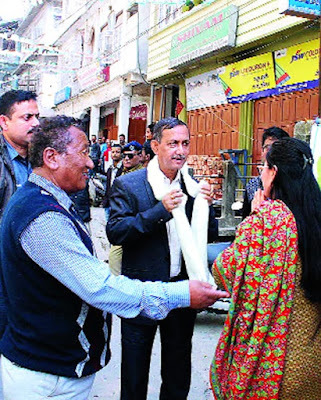 This time, we must definitely ensure the victory of the Trinamul candidate from the Darjeeling parliamentary election," he told party workers in Trinamul's Kalimpong office. Deb prefaced his statement by referring to many initiatives taken by the state government in the hills, including the formation of development boards for 15 different communities, creation of Kalimpong district and the decision to upgrade Mirik block to a subdivision by bifurcating Kurseong subdivision, among others. "Once all the projects are completed, there will be more job opportunities here and the socio-economic condition will also improve," said the minister. In the past few weeks, people have been flocking in droves to Trinamul, particularly after Kalimpong district officially came into being on February 14. It, however, remains to be seen if that actually translates into votes, come the elections. The terms of boards at the Darjeeling, Kalimpong, Kurseong and Mirik municipalities expired in December, but fresh elections are yet to be announced. There are speculations that they would be held in May. Panchayat elections have not been held in the hills since 2000. Elections to the GTA will also be due after August. The Gorkha Janmukti Morcha has won elections across all levels since the parliamentary election of 2009 when the party-backed BJP leader Jaswant Singh was elected from Darjeeling by over two lakh votes. However, its victory margin has been coming down progressively. In the 2016 Assembly elections, the anti-Morcha votes cast in the three hill Assembly segments was 1,94,699, which was a huge increase from the 1,57,890 anti-Morcha votes polled in the 2014 parliamentary elections. The Morcha got 2,50,026 votes in 2016. Observers believe there has been a further erosion of the Morcha support base since the last Assembly elections. "In the past three weeks, close to 10,000 people, most of them Morcha supporters, have shifted their allegiance to Trinamul. Things are definitely not looking good for the Morcha," said an observer.